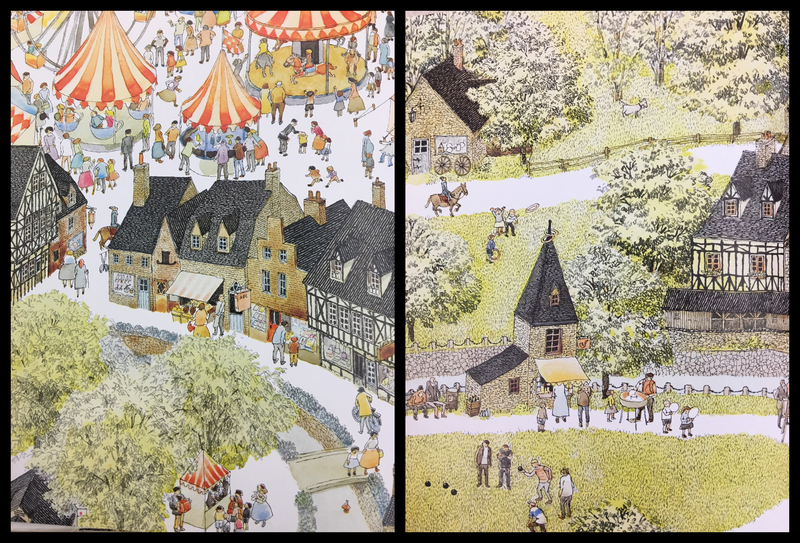 Charming, intricate, mischievous—those are just a few words that come to mind upon viewing Mitsumasa Anno’s artwork. His attention to detail pays homage to his career as a mathematics teacher before entering the world of illustration. Born in 1926 in the small, isolated town of Tsuwano, Japan, Anno longed to see the world beyond his hometown. Throughout his travels to various countries of the world, Anno sketched any interesting people, places, and things that caught his eye. In the mid-1970s, he put together a wordless book called “Anno’s Journey” that follows a man as he ventures through vast landscapes and crowded towns. The man can be found on each two-page spread, and finding him is part of the fun. It brings to mind "Where's Waldo?" and other seek-and-find books. The book was an instant classic, and the success inspired the creation of more “Journey” books, set in specific countries: England, USA, Spain, Italy, and Denmark. Anno is also the creator of several math-themed books. His clever illustrations and simple-to-follow math make the books enjoyable and educational. One of Anno’s most successful books is “Anno’s Alphabet” in which each letter is represented by an illustration of a carved piece of wood, most of them impossible. It’s these little Escher-esque “impossibilities” that intrigue and amuse readers. Each letter also has a corresponding illustration of something that starts with that letter, and some of these illustrations are puns, or have those "impossiblities" previously mentioned. The floral borders also have the "seek and find" aspect of "Anno's Journey" and contain hidden objects starting with the letter.